The American Council for an Energy-Efficient Economy "Greenest" and "Meanest" 2013 vehicles is a welcome shot in the arm for beleaguered Toyota. Considering aggressive national fuel economy standards for model years 2012 to 2025, automakers have beefed up efficient vehicle options for 2013 and ACEEE's Green Book Online provides more information to make a prudent, environment-friendly investment in a new vehicle. Under the "Green Score" section, ACEEE's Green Book Online you will find this year's greenest models, as well as the 12 most and least environment-friendly vehicles. Toyota Prius C Top Spot. 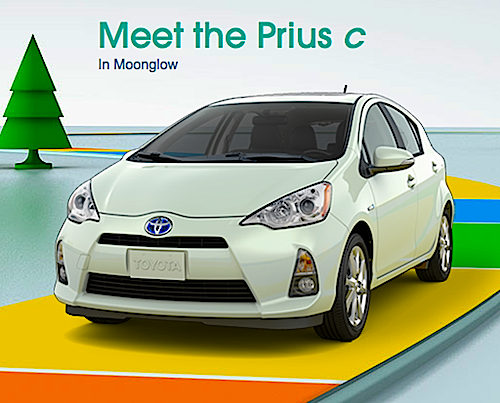 The Toyota Prius C bested other vehicles out of 58 candidates. It’s not bad for a vehicle that made its debut on the American market last year. The original Prius faired well also with a #3 position, but the new plug-in Prius hybrid only ranked #4. As far as the larger Prius V it came in at #11. The Other Greenest Vehicles. The other top contenders were the Honda Fit electric vehicle that came in at #2 and the Honda Civic Hybrid #5. This was followed by Ford’s Focus EV, Fusion and C-Max hybrids. European vehicles were also represented with VW’s new Jetta hybrid and the Smart ForTwo placing, respectively #7 and #8. This year, conventional vehicles were, as we would expect hybrids, plug-in hybrid-electric, and all-electric vehicles. The only exception were the Scion IQ and Smart ForTwo that remain on the list. The 8-time first-place Honda Civic Natural Gas vehicle was pushed out of the top twelve in 2013. How ACEE Scored Vehicles. There is green and then, there is green. Defining green is also an exercise in difficulties and confusion. ACEE looked at as many facts as possible to determine the eco-performance of the 2013 models. Analyzed on the basis of a “Green Score”, which includes unhealthy tailpipe emissions, fuel consumption, and emissions of gases that contribute to climate change. However this would not give us a deeper look at behind the scenes. We would also like to see in the future the manufacturing process. In order to address this, this year, a number of updates were made to determine more accurately the vehicles’ environmental impacts estimates. These include updates to emissions from the vehicle manufacturing process, as well as changes to gasoline, diesel, and natural gas upstream emissions and updates to the forecasted mix of fuels used to generate the electricity used to power electric cars. The greenercars.org website provides most of the numbers and identifies available vehicles in different classes. This “Greener Choices” list includes trucks and SUVs. As the list developed, it is showing how consumers can make “greener choices” with the vehicle they need. As a side note, domestic manufacturers claimed six of the twelve “Greener Choices” spots. The Ugly! On the “Meanest” side of the list, a not too-surprising number of heavier light-duty vehicles pushed out European sports cars as the least friendly to the environment. The dirtiest vehicle for 2013 is the Ford F-350 FFV pickup truck with a Green Score of 17, followed by the Ford F-250 (FFV), and Ford E-350 wagon, both also scoring 17. Looks like Ford to give us EcoBoost engines there. You will find write-ups on model year 2013 highlights, a consumer primer on vehicles and the environment, as well as advice on how to buy green when shopping for a new car or truck on the greenercars.org website. All in all, this is good news for the industry overall. In less than a decade, larger vehicles have achieved what carmakers said they couldn’t do, become much more fuel efficient. It proves to show how a recession, business models pushed beyond a modicum of intelligence eventually flatline and customers turn away. We are happy to see the American Council for an Energy-Efficient Economy, ACEEE highlighting the “Greenest” and “Meanest” vehicles for 2013.